Very happy to have the Essential Moments exhibition at Cinnamon Indian Cuisine in Rhinebeck, NY! The exhibit opens on April 5 from 4-6pm and runs through May 1. Hudson Valley Magazine rated Cinnamon Indian Cuisine as the best Indian restaurant in the Hudson Valley in 2012. 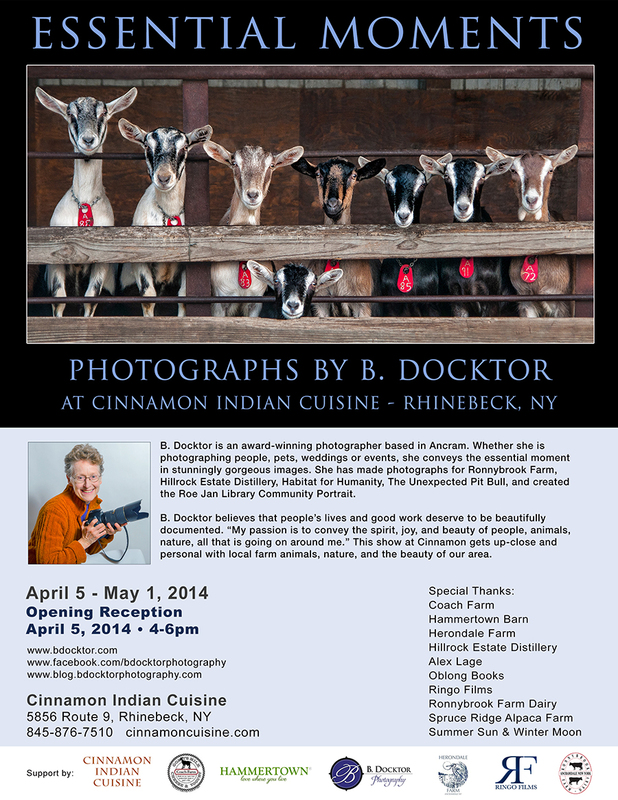 I’d like to thank Shiwanti Widyarathna, Cinnamon Indian Cuisine’s owner, for the invitation to exhibit Essential Moments–a beautiful collection of photographs of farm animals and scenes from Dutchess and Columbia County. Some of the locations represented at Essential Moments are Coach Farm in Pine Plains, Dashing Star Farm in Millerton, Herondale Farm in Ancramdale, and Spruce Ridge Alpaca Farm in Old Chatham. Also showing closeups of nature–water and flower images that have a soothing and joy-giving affect in the offices of hospitals, doctors and therapists who have chosen to decorate with these photos. Cinnamon Indian Cuisine serves contemporary Indian food rooted in age-old traditions and has received a 5-star rating from Hudson Valley Magazine. Cinnamon is at 5856 Route 9, south of the village. For more information please call 845-232-5430.